ELY: A deceptively large and exceptional five bedroom semi-detached home which has been modernised to a high specification throughout and offers luxurious accommodation within walking distance of local amenities and the Littleport train station. • The exceptional standard of the property is evident before even entering the home, with the front porch featuring Yorkstone paving, a European canopy, and bespoke oversized oak front door and frame. Once inside, the property offers underfloor heating beneath porcelain-tiled floors and LED lighting throughout the ground floor. • In the entrance hall, there are two oak-faced doors to the entertainment cupboard, featuring an oak storage unit for media, sound and vision components. There is also an oak staircase to the first floor, with a glass balustrade, and access to the ground floor cloakroom, with Bauhaus units, Corian top, and teardop basin against a background of exposed period bricks. Through a sound-proofed glass door is the remainder of the open plan ground floor. In the living room is a recessed TV aperture, Cat 6 cabling, built-in speakers, and LED lighting. This leads to the dining room with a feature oak wall and bifold doors to the secluded, courtyard patio. Through the dining room is the spectacular kitchen/breakfast/family room. It features a range of Nolte German high and base level units with dust seals and soft close hinges, bespoke Dekton worktops, Blanco sink, Fisher & Paykel appliances which include two pyrolytic ovens, one steam oven, coffee machine, and five-ring gas hob with Gutman remote control extractor, Quooker instant boiling water tap, and large anti-sun roof light. Wall-to-wall bifold doors lead to the rear garden, allowing for an open, free-flow entertaining area. An archway leads to the utility room with Nolte German units, Dekton worktops, Siemens washer/dryer and dishwasher, Tapworks water softener, and doors to the courtyard patio. • The quality and attention to detail continues to the first floor, with oak flooring in the landing and oak joinery throughout the first floor. 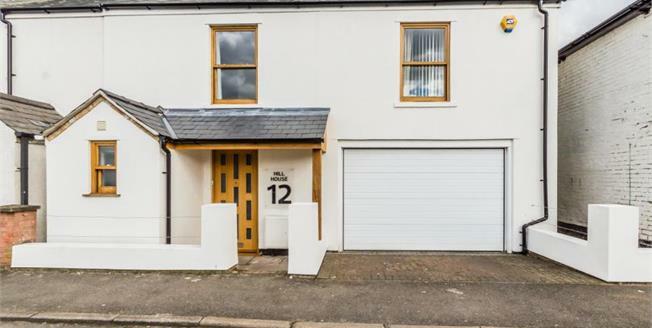 There are four bedrooms, with Bedroom 1 having the benefit of built-in wardrobes, tilt and turn French doors to the balcony, and an en suite. The en suite has tiled flooring, oversized towel radiator, Bauhaus basins and units, WC, double slimline shower tray, Velux roof light and instant hot water from an independent, pressurised cylinder. Bedroom 2 also has the benefit of a deep, built-in wardrobe, which features a bespoke drawer unit, and an en suite, with Bauhaus units, Corian work top, and slimline shower tray. Bedroom 3 features original pitched pine floors and cast-iron fireplace, while Bedroom 4 has oak flooring and is currently being used as a study. In the family bathroom, there is Karndean flooring, travertine and slate tiling, and a four-piece suite with slipper bath and floor-mounted tap, WC, built-in vanity with basin, and corner shower. • Glass-balustraded stairs lead to the second floor and Bedroom 5. The oak detailing continues, and there are two eaves storage cupboards and two Velux windows. • Outside, the garage has front and rear Hormann electric opening doors. The garage has cedar wall panelling to the internal walls with power and light connected. To the rear is the large enclosed garden, which has been Astro-turfed and has LED lighting. There is also a workshop/studio with power and light connected. • A full EPC report can be made available upon request.